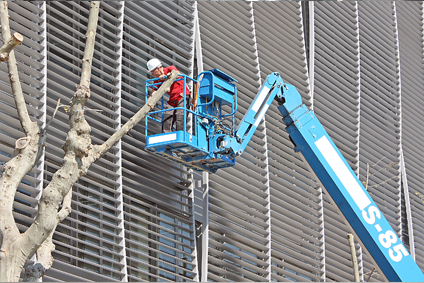 Regular arranged cleaning of windows, fascias, girders will prevent them becoming unsightly or weathered. High level cleaning is a specialist service and should always be undertaken by a professional company. With experience working across all sectors we can clean all high areas of your premises. Working to health and safety standards our contract managers complete a risk assessment prior to commencing any service. Our operatives are IPAF and PASMA trained to industry best practices utilising scissor lifts and self propelled booms to undertake effective high level cleaning. In addition, our experienced team can also undertake other high level services such as guttering, roof cleaning to any frequency in line with your business requirements, allowing Waring Facilities to be central in all your high level building cleaning requirements. Our service includes the supply of the access equipment along with the appropriate health and safety documents and risk assessments.